First - I'd like to mention that the results from this past weekends races at Wake Forest made it onto VeloNews.com, which is a cycling publication that is pretty cool, so I was stoked to see results posted there. This week was a little tough to find time for the bike but I managed an easy hour on Monday afternoon for an active-recovery ride, 1-hour-55% of Functional Threshold Power (FTP). 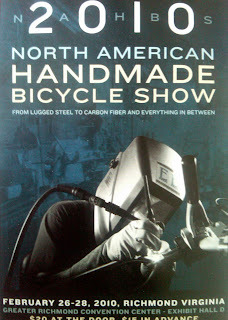 Tomorrow morning I'm leaving earlier than usual for a race weekend since the North American Handmade Bicycle Show (NAHBS) is in Richmond, the first time it's been on the East coast that I know of, and certainly not an opportunity to miss. Super stoked for this event! Four of us are leaving around 8AM tomorrow and will spend the day at the show before driving to MD for the night. 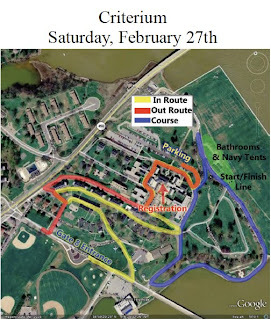 The Naval Academy host this weekends ACCCyling event with two races, a criterium on Saturday followed by an individual time trial on Sunday. Posted by Unknown at 7:20 PM , Links to this post , 1 comments I'm reading from MyDailyGround: Naval Academy Preview + NAHBS Tweet this! For some reason I didn't sleep very well Saturday night. It may have been a combination of the hotel room being cold, or the bright street light right outside our window that kept making me think it was later than it was; either way I managed to see the clock about every hour throughout the night. After several alarms in the early morning we abruptly awoke to a knock on our door at 6:21AM, nine minutes before we were supposed to be downstairs. I quickly packed all of my stuff which seemed to have exploded all over the room and headed downstairs to enjoy the complimentary breakfast. After two slices of whole wheat toast with butter and jelly, a few mini-donuts, a glass of orange juice, and a cup of what seemed to be coffee but might have been muddy water I was fueled and ready for my early race at 8:30. We got everyone into the vans and headed towards Wake Forest campus where the race was being held. We arrived early at the race and quickly unpacked bikes and setup camp with races beginning within a half-hour after we arrived. 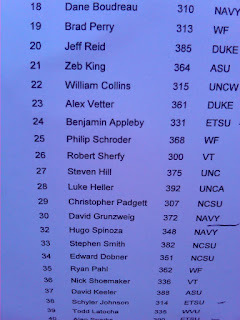 The Men's Collegiate D were first and several Tech riders had high finishes including a second place. My race began at 8:30 promptly (unlike Day 1) and it was quick from the start with several attacks and crashes within a couple laps. 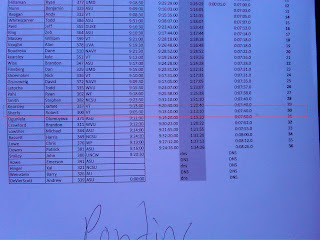 I felt great riding top 10 for most of the race. I had the elapsed time on my power meter showing and with 2 laps to go I was beginning to feel the toll of the first 28 minutes of hard accelerations. coming out of a turn on the second to last lap I caught the rear deralleur of a UNC rider and wacked my wheel pretty well. 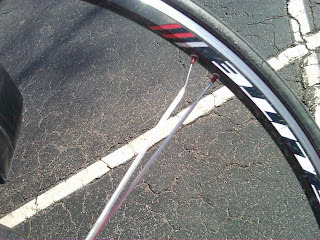 Thankfully both of us managed to keep the rubber side down and I finished the race a few seconds behind the bunch. After finishing I took a better opportunity to look at my front wheel, it was rubbing on each revolution and pretty out of true. Wake Forest Criterium Mens C - Finish from MyDailyGround on Vimeo. One advantage of having my computer used to tape the finishes all weekend, is having my finish footage! After my race I cleaned up (more on cleaned up later), changed, and watched the remaider of the days races trying to get some cool photos of the team. One fact that should be noted is that myself and two other guys headed to Whole Foods to pick up some snacks and also pick up some beverages not available in Virginia. After debating for awhile about my selection I chose New Belgium Breweries - Fat Tire, brewed in Colorado and unavailable in Virginia due to the freshness policy (takes too long to get to VA) it also has a sweet bicycle on it. I was heartbroken however when an employee came over to tell me that they couldn't sell beer until noon. After returning defeated, but with sushi and chocolate milk in bag we watched the Men's A tear up. When we arrived in the morning the referee informed the field that there was ice in the back corner of the race, a shaded area, and that sand had been put down to try to improve conditions. The sand combined with the warm temperatures for the day made for nasty conditions and a ton of dirt off the road. Everyone returned dirty and covered in grit and grime, I had brought baby wipes which worked wonders cleaning up my face (about the only part of me that was covered since our race was about 40 degrees). Another awesome weekend of ACC cycling! 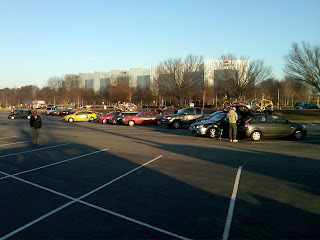 Posted by Unknown at 8:13 PM , Links to this post , 0 comments I'm reading from MyDailyGround: Wake Forest Race Weekend - Day 2 Tweet this! 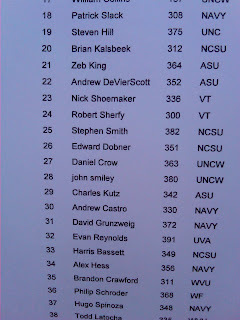 This weekend was the second weekend of the ACC Cycling at Wake Forest University in Winston-Salem, NC. Winston-Salem is only two hours away from Tech and the team decided to leave early Saturday morning to avoid extra hotel costs and make the weekend a little shorter than N.C. State. The morning began early for me with my alarm going off at 4:15AM to head to the parking lot where the team was meeting. After we quickly packed the van the team headed south on 81 towards Winston-Salem. We arrived early and unpacked to prepare for our first race of the day, the individual prologue. The individual prologue was a short 3.75 kM race based on fastest time. After suiting up and a quick warm-up on the trainer, I headed down the road towards my start to the prolgue. My start time was at 9:03AM but with a few riders missing their start times before mine, I didn't leave until 9:05:30 AM. The course started out with a fairly significant climb followed by a few rolling hills. I think I went out to hard on the first climb and struggled to recover for the rest of the race. My power file for the race is below, the huge spike at the beginning is the climb at the start, and the significant drop at the end is where I forgot to hit interval after I had crossed the finish line. Bad news, my power file somehow got corrupted and won't open. Bummer! 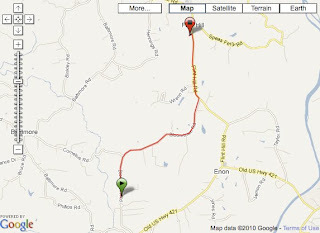 However I did have my Garmin 310XT GPS watch in my back pocket and recorded all of my power data and GPS information. Garmin Connect Prologue Data. Mike exhausted after the prologue. Justin with Captain America sunglasses. The Girls, Edie and Irene. The race was staged at a Flint Hill Vineyards and I snagged a few cool photos of my bike and a kindof funny one about the possible dangers. Kyle staying clear of the pesticides. At 10AM, shortly after the prologue the Men's A and B races began, the races were 50 ish and 40 ish miles respectively. The start of the Men's B race. Wake Forest Road Race - Men's A Start from MyDailyGround on Vimeo. My race began at 1:00, so around 12:30 I got dressed and hopped on the trainer to warm-up. After warming up and making sure I was ready to go I headed to start line where most of the C field was waiting to begin racing. Unfortunately right about the time our race was about to start the official let us know that the race was delayed a half hour. After another half hour warm-up and a course preview we were finally lined up for the our start. The race began and the first of three ten-mile laps was very uneasy will a lot of nervous braking by the group. By the second lap the pace had picked up and the field had shrunk in size from only ten miles. Around 3/4 of the way the way through the second lap I popped an went off the back sturggling to rejoin the group once more before finally falling off. I spent the remained of the 12 miles with a pace group of 4 before finally falling off about a mile from the finish. I continue to improve in fitness but didn't have enough to stay with the gruop this weekend. My power data from the road race is below. 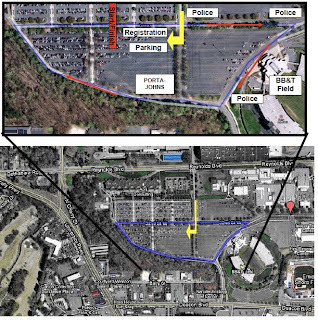 Posted by Unknown at 5:25 PM , Links to this post , 0 comments I'm reading from MyDailyGround: Wake Forest Race Weekend - Day 1 Tweet this! It's been a very long week here in Blacksburg with an overwhelming amount of school work and trying to get some quality saddle time in as well. Monday began with a nice spin as an active recovery ride from Sunday's race. I kept the power below 55% of FTP (~200W) and heart rate below 68% of peak. 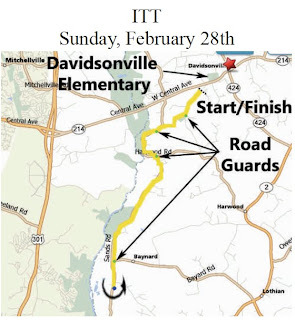 Tuesdays workout was interval based in preparation for this weekends prologue (a Prologue is a short time trial) at Wake Forest, that will proceed the road race on Saturday. I did 4x5 min. intervals at about 110% to 125% of FTP. The first interval was a little high compared to the other three, meaning I might have gone out to hard, but it was a good workout and my first time doing "a real" interval workout. Wednesday I went to TriAdventure swim practice and just felt exhausted, I was so sleep deprived/ burnt out that I just got out of the pool 3/4 of the way through the workout and decided I'd had enough. Thursday was a bit more productive of a day with a trip to Lynchburg for school and a quick evening ride at endurance pace with a few 110% - 1:30 efforts. Today I had the opportunity to get outside and ride with the awesome weather we had. A SAYG (slow as your grandmother) ride with the team at a very relaxed pace for about 18 miles. Posted by Unknown at 8:38 AM , Links to this post , 0 comments I'm reading from MyDailyGround: Weeks worth of Training Tweet this!